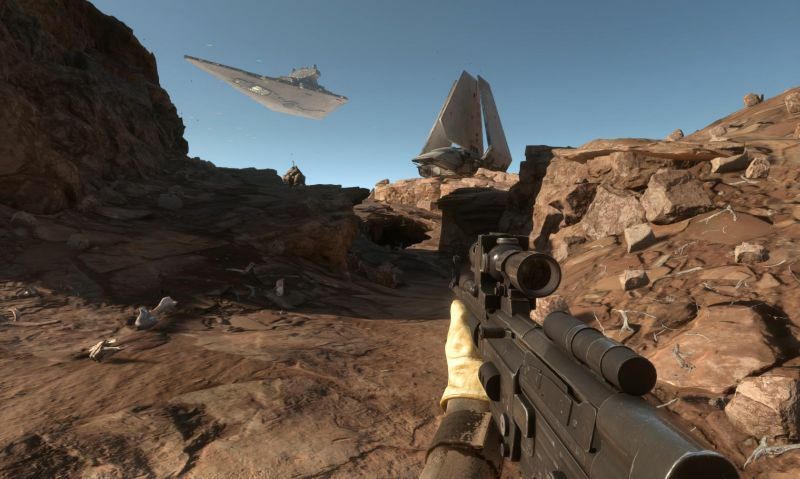 As in various EA games like Battlefield 4 and others, it’s also possible to hide the UI in Star Wars Battlefront. If you came here with the question how to hide the user interface in Battlefront, you probably have already a reason why you want to do this, but if you wonder why someone should do this, I can tell you there can be several reasons. Some people like to hide all the interface elements because they want to take clear screenshots of the game. Other people might want to hide the interface to be able to take videos of areas in the game, for example action or storytelling videos. There are probably even more reasons. I assume you came here with a reason, so, let us just disable the UI. First we need to know how to open the console in Battlefront. You can open the console with the tilde key (~). Write the command “UI.drawEnable 0” without quotation marks into the console and activate it with the return key. The user interface should now be disabled completely. To enable the user interface, open the console again and type in “UI.drawEnable 0” without quotation marks. Usually I would suggest to put certain commands into a configuration file, but in this case it doesn’t make a lot of sense, it would be hard to navigate through the game menus if the command would be enabled permanently. So, you are good to go if you just use the console as mentioned in my steps. I wrote a list of other Battlefront console commands. I hope this guide helped you to understand how to hide the user interface in Star Wars Battlefront. Feel free to drop a comment, and if you liked the article, help me and share the tutorial with other people on your preferred social media sites. Have fun! Hi there. I just don’t know how it happens but the console opens once and again and I just cannot close it. I have to shutdown the game. This is ruining my gamming experience. I’m using a spanich layout keyboard from ozone gaming. If you could help me out to short this thing out because I am not capable to print on screen that middle tilde. Thnx a lot and Merry Christmas. They didn’t include the option to rebind the key that opens the console. The only thing you could do is using an external key mapping tool. I think there are tools outthere where you can switch functions on your keyboard and make profiles and so… I don’t remember the name, but I had one of those tools installed once. Merry Christmas to you too!